Our 20 foot tall 3 lane water slide is perfect for any type of summer party or event from birthday parties to water day events. 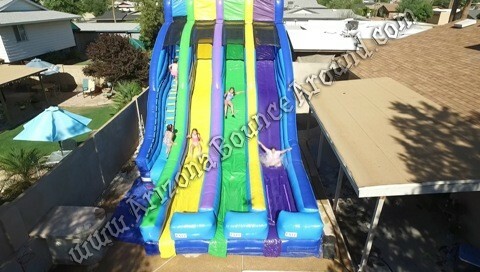 This awesome slide will be a big hit and keep the lines moving so rent one today for your next party or event. All of our big water slides are made without pools to keep the slide sanatary and clean during use. Water slides with pools are not suited for high volume events and we have a huge selection of water slides with this feature. This water slide requires 2 electrial outlets on seperate breakers or a generator for power. We only rent high quality water slides made by the best manufactures in the business so rest assured that any water slide you get from us will be top quality including this custom made 20' tall tripple lane water slide. You wont find this water slide anywhere else but Gravity Play Events. 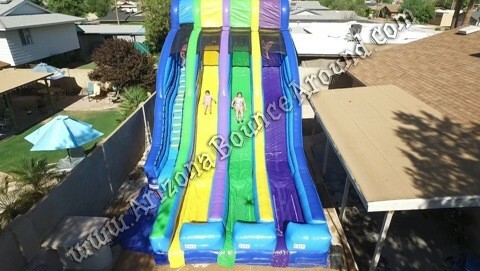 Be sure to check out our great selection of summer games and activities to add to this water slide rental.